The greatest thing to come out of Buffalo, NY is their wings. Buffalo wings are chicken wings and drummettes that are fried without breading and then coated in a vinegar based sauce typically comprised of melted butter and hot sauce. They're served with a cool, tangy blue cheese dressing for dipping and some crisp celery sticks. Buffalo wings are the ideal party food guest: they get along well with others like pizza and nachos, and they're best buds with cold beer. So they've got to be part of your Super Bowl party line-up, even if you're making different wings like my Maple-Beer-Chili Chicken Wings (which you really, really should). They're too self-confident to be intimated by other wings at the party. 1. For the buffalo sauce, whisk all ingredients in a bowl. 2. For the blue cheese dressing, stir ingredients together in a small bowl. It will be lumpy. 3. Pour 4-5 inches of canola oil in a medium pot over high heat. Pat wings dry. Place in very hot oil (about 350 degrees F) for 10 minutes, or until golden and crisp. If you don't have a thermometer, test the oil's heat by adding a bit of chicken fat to the hot oil. It should sizzle and float to the top, surrounded by bubbles. Place on a paper-towel lined plate to drain. Cook in batches so they’re not overcrowded. 4. Transfer cooked wings to a large bowl and cover with buffalo sauce. Toss well. Serve with blue cheese dressing and celery sticks. Note: When buying chicken wings, look for "party wings" or wings that already have the tips removed. They're usually slightly more expensive, but you get more meat for your money and will save time by not having to remove the tips yourself. 1. 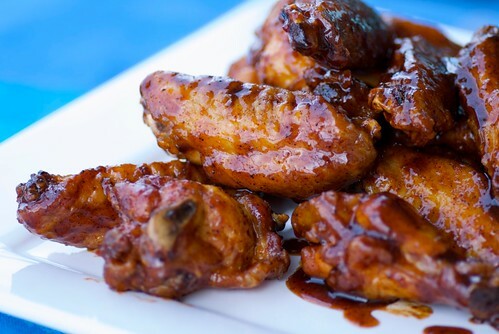 Spread chicken wings in a single layer on a large baking sheet. Drizzle with 1 tablespoon canola oil and season with salt and black pepper. Bake at 425 degrees F for 25 minutes, turning once, or until golden brown and crispy. We aren't hosting this weekend but your maple-chili wings will be mine (okay... ours) in the near future. I just won't make the mistake I made last time with wings (for the sake of a few pennies)... buying the wings whole and having to go at them with a butcher's knife (which led to chicken cartilage flying all over the kitchen - ick!). I see I'm not the only one with wings on their mind today! Buffalo is just south of us and Toronto's pubs all have Buffalo wings. I love your hot sauce but purists will tell you it's just Frank's hot sauce and melted butter....a ticket to the triple bypass! Those wings are to die for! Great dressing! I remember the first time I tasted Buffalo chicken wings with blue cheese dressing -- not in Buffalo, but at a small roadside bar in upstate New York, on the way to Kingston Ontario. We were driving our daughter and a friend to college, and the friend knew of this bar, and these wings. They were so delicious that we got a huge box of takeout and ate them in the car. Sloppy, yes, but oh so good. I am sure bookmarking this for a weekens film evening ehre at home. I can now iself hear lots of licking fingers . How have I never known how easy it is to whip together some blue cheese dressing? Susan, those wings with blue cheese sound divine! Thank you for stopping by, I'm sooo bad visiting blogs nowadays... I subscribed too many feeds and don't have time to check them all. Glad to hear from you, now I moved your rss to new folder with selected blogs so I will be up to date with your articles. How absolutely scrumptious looking. My husband loves these - maybe I'll have to use your recipe and make some for Sunday! You could always try All Spice Cafe Gourmet Hot Sauces, www.allspicecafe.com. All of our sauces go great with wings (as well as all kinds of food), are all natural and vegan friendly! Hot damn! Thank you for this. It looks fantastic. I've been craving wings ALL day. So much so that I ate some "Blazin' Buffalo & Ranch" Doritos. Verdict? NOT the same. wow these look amazing, finger licking good! Wings are definitely on the menu this weekend! Yum! Thanks so much for the link - and I love your maple wings idea - looks amazing! Hope you have a fun Super Bowl! I love both of the recipes and the blue cheese dressing sounds very intriguing! 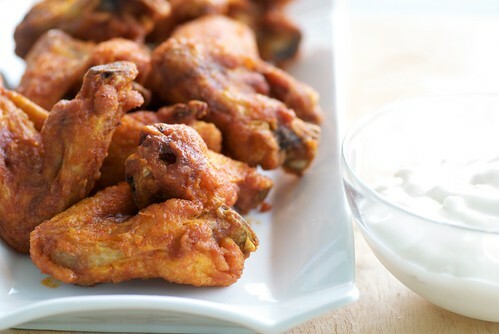 Buffalo wings are one of my most favorite, favorite party snack. Even though I've enjoyed all of the variations on the blogs, it's nice to see a more traditional recipe pop up. I'm of two minds about getting wings with the tips cut off. It's a pain to do it yourself, but they're great to save for stock! Mmmm, wings! A bit of vinegar? Beautiful! We love Crystal hot sauce for wings, but don't know if it is available everywhere. Classic! I'll take these any day! I could eat these (almost) every day! All the years I lived in the US I never had these... Now I can make them in France ;-)) Gorgeous! Hi, I'm Jenn from Jenn's Menu and Lifestyle Blog. Love your blog! Those wings look yummy! Love the short and simple list of ingredients, blue cheese is my all time favorite. wings! it's not too late......those look delicious! Wow! Chicken looks so good! Made me call Domino's for delivery!